On Friday, May 27th, I attended the final weekend for LA Ballet’s performance of Giselle at the Broad Stage in Santa Monica. The ballet Giselle is near and dear to my heart because it was the first ballet that I performed a leading part in, dancing the role of Myrtha. Also, this marks the third time I have seen Giselle performed professionally. The first was The Royal Ballet in London and the second was ABT at the Orange County Performing Arts Center. Both were wonderful, although my nosebleed seats for the Royal Ballet definitely left much to be desired. What one notices first about the LA Ballet as the lights go down, is that there is no orchestra. You hear murmurs around you whispering, “Is this a recording?” There is something magical about hearing the musicians tune and warm up before the show starts, it sets the tone that something big is about to happen. When LAB has more of a foundation, I very much hope that they put funding into an orchestra, at least for their full length ballets. When the curtain rose, we found ourselves in the Rhineland of the Middle Ages during the grape harvest. The set consisted of two tudor style houses, one that housed Giselle and her mother, and the other was in possession of the Duke Albrecht, who disguised himself as a peasant in order to sow some wild oats before his marriage to a noblewoman. Giselle and the disguised Duke meet, and of course fall in love, much to the dismay of Hilarion—a gamekeeper who is also in love with Giselle. Giselle’s mother worries for her weak heart as Giselle and others dance for the noblewoman (Albrecht’s betrothed) and her father who have come upon the scene. 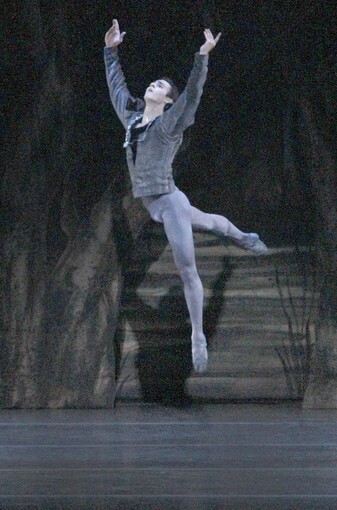 Hilarion reveals the truth about Albrecht, sending Giselle into a mad fit that her heart cannot handle, and she dies in Albrecht’s arms at the end of the first act. Like many two or four act ballets, the first half is dedicated more to story set up, and the second half is dedicated more to dancing. I usually can not wait until the second half for the juicy pas de deuxs and sad climaxes that my favorite ballets have in abundance. That being said, I very much enjoyed the entire first act. Allyssa Bross danced the title role to perfection. Bross is a first season dancer at LAB but a huge standout. She also danced the Sugarplum Fairy in 2010′s Nutcracker. What made it so enjoyable to watch, because of the route many first halves have to contain too much set up, was her complete embodiment of Giselle. Bross was so sweet, excited, and in love the way teenagers are. Shy and overreactive in very charming ways. The audience would laugh at her facial expressions because they were so endearing. Opposite Bross was Christopher Revels, also a first season standout. A Tommy Kirk doppelganger, Revels is strong and promising. He did take a fall during a group dance, and you could see him lose momentum on his face after that. There was nothing behind that smile but disappointment, understandably, until enough time has passed to shake it off. Hilarion, danced by Chehon Wespi-Tschopp, was not given much to do in the first act but look discouraged. Unfortunately, Wespi-Tschopp is less of an actor dancer, and his actions did not fill the space, which drew attention to it being a “play,” simply because he did not commit enough. The high point for me in the first act was the Peasant pas de deux, danced by Allynne Noelle (also a first season dancer) and Kenta Shimizu (Guest Artist from K-Ballet and Miami City Ballet). Noelle had excellent side extensions and was in full control of her body. A series of pirouettes with a preparation from Noelle on one knee were especially impressive. Both Noelle and Shimizu had strong and impressive solos, and the audience was eager to erupt into applause after everything they did. 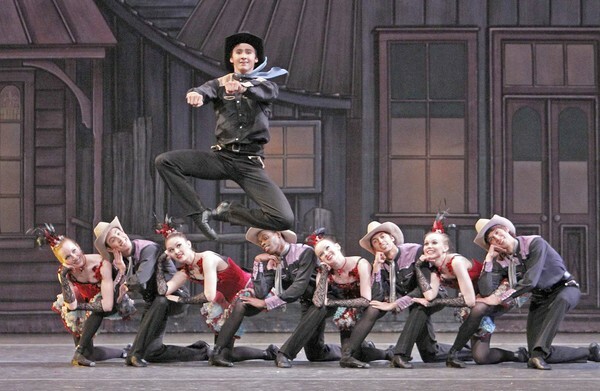 The reason for the solos and pas de deux by the peasants is very much lacking. Giselle leads them forward to dance, and they do, and then we never see them again. But when the dancing is so impressive, who cares why they are doing it? If it were a modern ballet, it would be easier to criticize the choreographer’s plot intentions. But Giselle was first done in 1841, and although the choreography has changed a bit, most of what we see in modern versions is still from the stagings in 1884 and 1903. So even the newest version is over one hundred years old. The second act takes us to the woods where Giselle has been buried. Giselle is summoned from her grave by the Wilis, the spirits of women who have died before their wedding day and roam the night seeking revenge upon any man they meet, by dancing him to death. Hilarion searches for Giselle but meets his end with the Wilis. Albrecht also searches and finds her, Giselle still loves him and forgives him, and unlike Hilarion who is found by the Wilis and thrown in a lake, Albrecht is protected from them by Giselle. When day breaks, Giselle’s soul is freed because she did not succumb to vengeance and hatred of the Wilis. I have to hand it to LAB; I have never seen the Wilis portrayed in a more unearthly way. I used to watch a VHS of Natalia Makarova’s Giselle with the Kirov Ballet, and even then it did not come close. The Queen of the Wilis-Myrtha (danced by Kate Highstrete) begins the second act with three solos. She did have a little trouble with her ponches, but she made up for it. Her moves were robotic but yet still enchanting. Her looks to the audience were jerky and blank, not fluid and soft which we are so used to knowing as beautiful ballet. I could not take my eyes off her, she was other worldly which is fascinating to see danced. The Corps de Ballet of her Wilis had their own ethereal qualities. They kept their eyes down to the ground and looked very sad. It was haunting. When the Wilis kill Hilarion they come alive and we the audience finally see why Wespi-Tschopp was cast as the unrequited lover. His dancing in the second act is more visceral and exciting than anything else in the entire ballet. Bross and Revels dance the lovers pas de deux and feature some gorgeous lifts to Adolphe Adam’s score. When beautiful dancing meets beautiful music, I cannot think of anything more exquisite. Giselle marked my sixth LAB production and it was by far the best that I have attended. The company has nailed down some very talented dancers. One can only hope that we get to keep them here in Los Angeles and not lose them to other cities with older and more well known ballet companies. I may be old fashioned but I very much look forward to more full length ballets in the upcoming seasons. The ballets under consideration are Swan Lake, Sleeping Beauty, Onegin, Coppelia, and Romeo and Juliet. LAB is finished for the season, but will open their sixth season in the fall with the tradition of The Nutcracker. Mishappen Pearl: Win Tickets to See L’Arpeggiata Live! Baroque is one of those words that seems to have somehow morphed into a false and flavorless definition over the years. These days, when I hear something described as ‘baroque,’ I instinctively think of haunted archways and Gothic ornamentation, but more than that, I think….old, dead, of the past. My old music teacher in middle school used to have a chart that mapped out, with cartoonish illustrations, the major periods of Classical music, and I distinctly remember the baroque portion of the chart appearing creepy and cold. But despite my probably colored memory and purely individual reaction to the term, I still feel our societal understanding of baroque, in general, has come a long way from the original adaptation of the Italian word barocco, meaning mishappen pearl—a singularly beautiful phrase. And one listen to the French early music ensemble, L’Arpeggiata, a collection of some of today’s most pre-eminent soloists who will be performing “Baroque Variations” at the Walt Disney Music Hall on Wednesday, January 19th at 8 PM, will illuminate that beauty within the word. Their mission as a group is “to revive an almost unknown repertoire and to focus especially on works from the beginning of the 17th century,” and that they do. When you watch the video above, or listen to one of their recordings, they don’t sound or look old, dead, or cold, they don’t even appear to be in strenuous revival-mode. They simply seem like they’re a group of extremely talented, modern musicians, having fun on stage. Which, I believe, is what the original baroque practitioners were doing as well. To win tickets to see L’Arpeggiata perform “Baroque Variations” at the Walt Disney Music Hall on Wednesday, January 19th at 8 PM, simply enter your first, last name, and e-mail address into the form below, and you will automatically be entered into the running to win not only those tickets, but the tickets for our next three giveaways as well. Talk about a pearl. A friend of mine and sometime contributor to this site Helen Kearns recently introduced me to the site, www.whosampled.com, a pretty amazing operation whereby you can look up an artist or title of a song, and the search engine supplies you with a catalog of other recordings that artist/song sampled and vice versa. The site is clearly still growing, and definitely doesn’t have every musician or track you can think of. But it is symbolic of an interesting trend I’m seeing more and more in contemporary music: reverse discovery. It’s different than nostalgia in that often one reverse-discovers music they’ve never heard before, and instead of the present reminding them of the past, it’s the past reminding them of the present. What I believe this is leading to in the music industry (and entertainment industry) at large is the reissue of old recordings, not ones that were once popular Billboard hits, but ones that may have may have silently slipped through the cliched cracks of mainstream culture. In fact, this is already happening on a small scale. One of my newest favorite albums, for instance, Air Over Water by Wall Matthews and Rusty Clark was released this year, but all the tracks featured were originally recorded from 1974 to 1986, the year Clark passed away. Chances are you probably haven’t heard of this album or these musicians, unless you reverse-discovered them through the popular British DJ, Four Tet, who illegally sampled their song “Neptune Rising” in his “She Moves She” (a fact not found on whosampled.com). Matthew’s and Clark’s music is hardly irrelevant or untimely, however. They just happened to be performing and recording a few decades before vocal-less acoustic and “Imagistic”—to use a word from the subtitle of the album, “Imagistic Music for Guitar and Violin”—were readily available outside of coffee shops and experimental dance troupes. To be fair, the name of the album does sound like an Enya-esque meditation soundtrack (though Enya is vastly underrated in my opinion, and has most likely enjoyed some reverse-discovery herself). But the actual music has no electronics, no singing, and with the exception of a few tracks, sticks to just two instruments. It could be dubbed minimalist if it were not for the full and entrenching landscapes these two instruments create. The first song of the album, “The Two Snails Who Went to the Funeral of a Dead Leaf” is a brash, Indian-inflected violin solo from Rusty Clark, a call to the wild that dances between Philip Glass-like repetitions and something more raw and untamed. The level of musicianship is clearly marked high from the very beginning, and maintains the kind of virtuosic intensity you simply don’t hear that much these days outside of a symphony. The second track, “Gypsies,” inaugurates the guitar-and-violin duets, which make up most of the album. And they are truly duets. The two instruments trade off positions of melody and landscape many times within a single song, and almost imperceptibly. Matthews finger-picks his guitar in fast, clear, ringing tones, reminiscent of Nick Drake, but with more complexity and variety. Meanwhile, Clark leads his violin through a veritable wonderland of genres, from medieval-court-like fare to free jazz to pop to what, in “Alabama Sketches” and “The Clowns,” I can only describe as pastoral dread. It’s tempting to call the songs on Air Over Water cinematic, because they are so visual, but then again, the music is what dominates here, and I’m not sure if would work taken into the soundtrack of a movie. What Wall and Rusty did, instead, and what feels more natural, was use it for dancers—a far more interpretive arena of expression that, like the instrumentation itself, works with (rather than on top of or below) the sounds. “The Clowns” is a quick favorite for any new listener to Matthews and Clark. It’s ostensibly simple, with a clear, defined structure, and brings to mind a comforting type of rustic domesticity. But there’s also a creeping suspicion in it, and the repetition becomes and integral part of what ultimately makes the piece so haunting. “The Blue Heart” introduces the first bits of piano into the mix, a welcome addition, especially with its combination of music-box simplicity and dissonant jazz. It a beautiful imbalance dancing with with innocent, would-be major key melody. It borders on the noir—a dangerous and flirtatious seduction between two ballroom waltzers. Whereas the album began with a triumphant violin solo from Clark, the album ends with an unassuming “Little Piece” by Matthews, just him on guitar, gently leading the listener out of his world, at least for now. I began to realize, then, how the idea of reverse-discovery might be inherent in some music, how even when Wall and Rusty were recording these works back in the 70’s and 80’s, they weren’t just doing it for that specific time. They were inviting an entire future, real or imagined, to experience and discover their unique vibrations. If you wish to reverse-discover more, you should definitely check out Matthews’s Riding Horses, Heart of Winter, Zen Gardens, Color of Dusk, and Gathering the World, as well as the work of the Entourage Music and Theatre Ensemble.